You can now officially get away with anything. 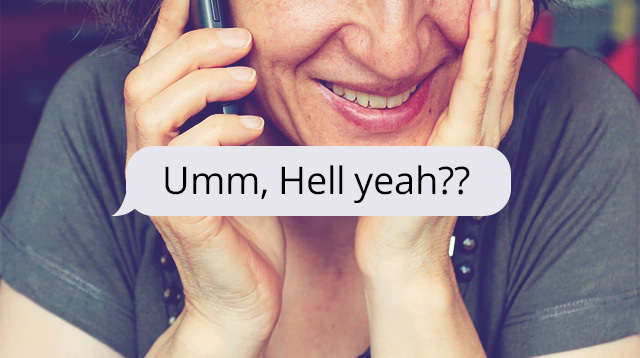 One girl has found the absolute easiest way to get her parents to let her do whatever she wants, by pulling a sneaky little prank on her mom's phone. Bex posted a picture to Twitter, showing how she's changed the word "No" in her mom's iPhone to autocorrect to the words, "HELL YEAH" instead. Pretty funny for us, pretty annoying for mom. The best bit is watching her poor mom try and figure out WTF is up with her phone, re-typing the same phrase four times before she presumably gave up and called her daughter to yell "NO!" down the phone. If you haven't used this function before, it's actually super easy. All you need to do is go to Settings -> General -> Keyboards -> Shortcuts -> Edit, and then click the "+" symbol to add new shortcuts. You then write the phrase you want E.G. "Hell yeah" and then the shortcut to get it E.G. "No." Obviously, you can also use this for actual helpful things as well, like changing "ill" to "I'll," "probs" to "probably" and "tho" to "though." Bex's post has now spawned a whole load of copies, with users all over the place pulling similar tricks on their moms, dads and friends. Props to the ones who realize that "nope" and "never" work just fine instead and to the sassy mum who manages to trick her phone by writing "know" and deleting the first and last letters.